The first image from Gemini South's new adaptive optics captures a view of the globular star cluster NGC 288. 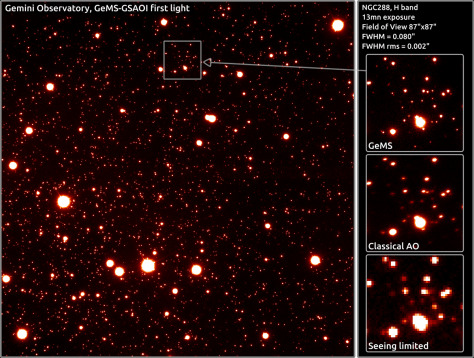 As shown on the left, with classical adaptive optics, the images are blurred due to turbulence in the atmosphere. Gemini South uses a system with five laser-created guide stars to subtract out the distortions, resulting in a clearer, sharper image.